Space saving is very important for every modern factory. 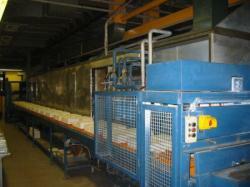 A project held in an industry with ceramic products there was a need for a buffer. Products went through an oven and then they need to cool down for some hours before they need to re-enter the oven again. A robotic arm was chosen to pick up the products and store them in overhead selves where they can cool down. Robotic arm can also pick up products and put then again inside the oven. Overhead layout has a very small footprint and freed a lot of space.